Legacy 2030 | Winston-Salem/Forsyth County Planning Board: What's Greensboro doing? 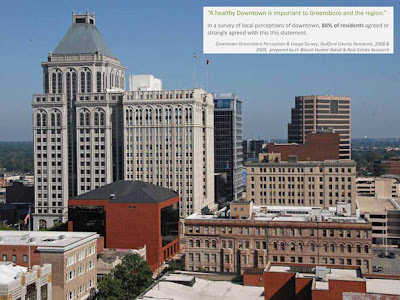 Greensboro’s downtown plan, the Greensboro Downtown Economic Development Strategy, suggests that a downtown defines its city’s “brand” or image. An effective brand attracts creative class workers, particularly younger members of the workforce. The Greensboro Downtown Economic Development Strategy identifies six priority projects that best have the ability to improve downtown Greensboro: complete the Downtown Greenway; encourage connectivity through a comprehensive streetscape program; incentivize quality, new mixed-use development; activate downtown’s unique historic building stock; create a signature performing arts center; and support a knowledge community by incentivizing colleges and universities to locate programs and facilities downtown.